A few weeks ago we went to an old kodan not far from where we live to inspect an apartment that was on sale. We had never had dealings with this particular real estate company before, and we arrived early to check out the general environment, which was better than it is for most kodan. This one was built in the mid-80s and while the buildings themselves were as dull and utilitarian-looking as any other, the landscaping was impressive: lots of clean, well-maintained mini-parks separating the buildings, which were situated at angles that took advantage of the sunlight. We strolled over to the apartment building where we were to meet the agent and just so happened to run into an agent for a different company setting up a sign outside the same building for an open house. We knew this woman well, having met her numerous times when we inspected other properties in the vicinity. She was open and knowledgeable and knew exactly what we were looking for. It was always a pleasure to talk to her because she didn’t put on the usual salesperson front. She told us that the apartment she was showing had been badly damaged in a fire. The owners had insurance, which covered the renovations. In fact, they apparently used the opportunity to gut the whole place and completely redo it. It wasn’t clear if the owners had been planning to move beforehand or made the decision after the fire (which is understandable–it might have been difficult for them to face their neighbors after almost burning down the building), but in any case the 70-square meter apartment was being sold for about ¥8 million. We told the agent we’d drop in after we inspected the other place. The other agent soon appeared and we went up to the apartment for the inspection. The owner was still living there and she was quite a character. In late middle age but dressed as if trying to pass for 35, she was quite proud of the remodeling she had done on the place. As with a lot of kodan built during that time, their was no elevator and so the entrance was to the side of the unit, allowing both ends clear vistas. To the south was the living room. 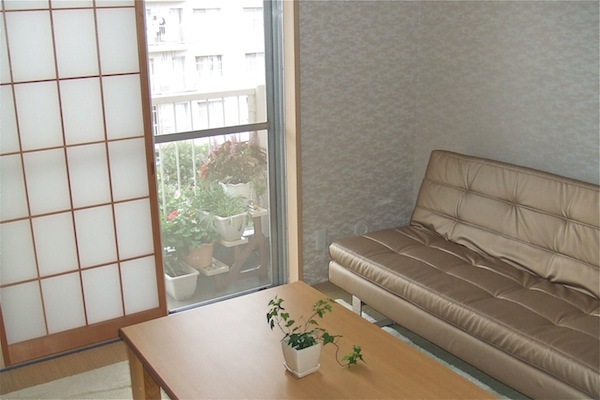 Originally that end of the apartment had two rooms, a living room and a smaller tatami room. She had combined the two and knocked out the wall separating them from the entrance, thus making the space invitingly open. The kitchen was in the middle of the apartment and she had replaced all the cabinets and fixtures. To the north was “my husband’s bedroom,” and another tatami room that was very smartly appointed, though the gold-upholstery sofabed was a bit much. None of it was to our taste, though we had to admire the woman’s enterprise, especially since she seems to have gone through all this trouble and expense just to unload the place at, again, about ¥8 million. We assumed that if she wasn’t losing money then she wasn’t gaining a whole lot, either, and from what we already knew there were quite a few units in this kodan that had been on sale for a long time. Unless someone had exactly this woman’s taste, it is likely she would have to reduce the price even more before she would unload it. 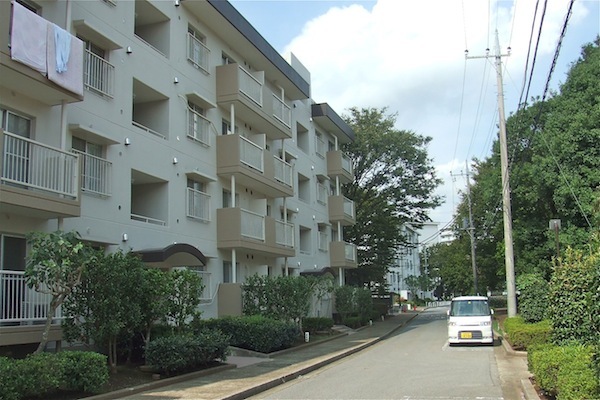 While leaving we, perhaps injudiciously, mentioned to the agent that we were going to see another apartment on a lower floor, the one being shown by the other real estate company. He said he knew about it and wanted to accompany us, which seemed a bit strange. We soon found out why. As we entered the other apartment, the woman agent intercepted us and practically pushed us back out. As politely as she could she explained that she couldn’t let us see the place under these circumstances. The agent who had accompanied us apologized and we left. Obviously, it was bad form to bring a competing realtor to an open house, and when we went downstairs we realized why. The realtor seemed to know a lot about the apartment, including how much the owner had paid to renovate it after the fire. He said they didn’t use all of the insurance money for the repairs, thus implying that even at ¥8 million it may have been overpriced. Because of our friendship with the other realtor we weren’t sure if we should be hearing this, but in any case the upshot is that this guy’s company had a listing for the apartment even if it wasn’t the main agent, so if he accompanied us to the open house and we actually decided to buy it, maybe his company would have demanded a part of the realtor’s fee. The other agent knew this, which is why she barred us right there at the front door. So glad I never got involved in sales of any kind, nor will any child of mine!